NFL quarterback Michael Vick has re-established his relationship with Nike, two years after his release from prison after a dog fighting conviction. NEW YORK (CNNMoney) -- Michael Vick, the star National Football League quarterback whose career was sidelined by a dog fighting conviction, has reached an endorsement agreement with athletic equipment maker Nike. "We have re-signed Michael Vick as a Nike athlete," said Megan Saalfeld, a Nike (NKE, Fortune 500) spokeswoman, in an e-mail to CNN. Vick, currently on the roster of the Philadelphia Eagles, served 20 months in federal prison after pleading guilty to bankrolling a dog fighting operation. The conviction cost him a $2 million endorsement deal with Nike and a 10-year, $130 million contact with the Atlanta Falcons. He has since emerged as a spokesman against dog fighting. "Michael acknowledges his past mistakes," Saalfeld said. "We do not condone those actions, but we support the positive changes he has made to better himself off the field." 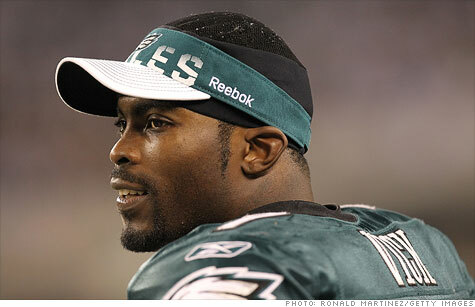 For his part, Vick said in a statement that he is "thrilled" to be back with Nike. "I am thrilled to be on the Nike roster. The brand represents the most exciting athletes in sports," Vick said. "My focus is now on preparing for the football season and performing at the highest level for my team and my fans." Vick signed his first post-conviction deal in January, when he sealed a two-year contract with Unequal Technologies, a company that makes protective athletic gear. He had worn Unequal apparel after suffering a rib injury against the Washington Redskins in the 2010-2011 season. -- CNN's David Close contributed to this report.